The bike I had was owned by a couple people and was raced a little to begin with. They must have adjusted the valves because I could see the cam cover had been removed and resealed. Judging by the condition of the engine I can believe that all the parts are original but the one thing they didn't do was check for valve movement left and right that would tell them that the guides are worn out. They were really bad so I'm sure they are the originals. Pop the valve cover off and we have the valve train - cams, cam caps, cam chain etc. Taking things apart is a matter of having a few basic tools. 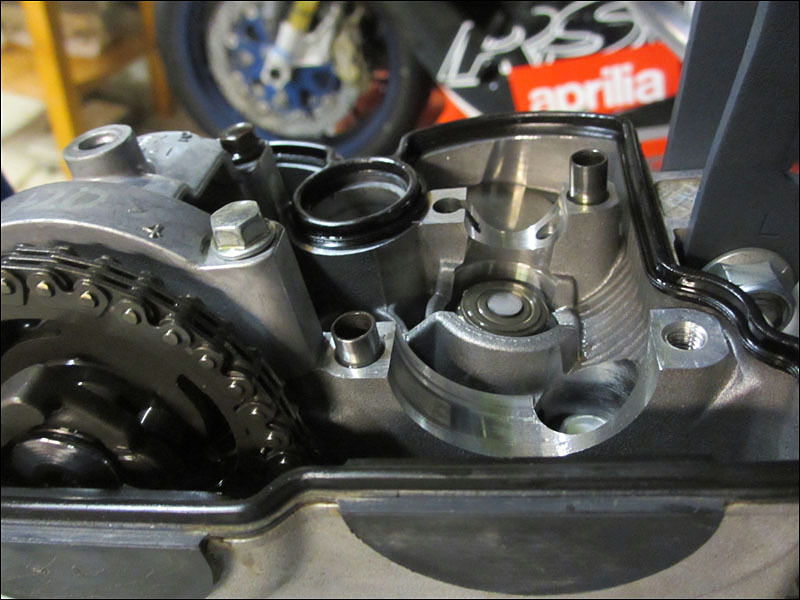 One good tool to have is the service manual for the RMZ250 or KX250F. This explains the whole process in very good detail. Here is a close view showing the cam journals. It's always to see flawless wear on the cams. If you had an oil shortage in this area due to blockage or an air bubble in the oil system you would surely see some damage here. The surface where the cam journal spins would be galled up or discolored. On the far side of the smaller cam journal you can see a round shiny surface which is the bucket. 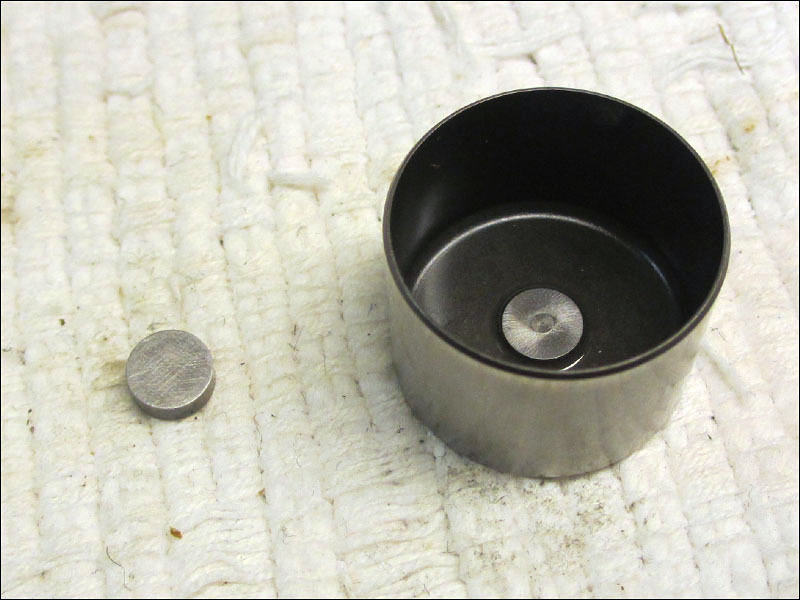 This is a "cap" (think cap gun) that sits on top of the shim that is centered in the valve spring retainer. 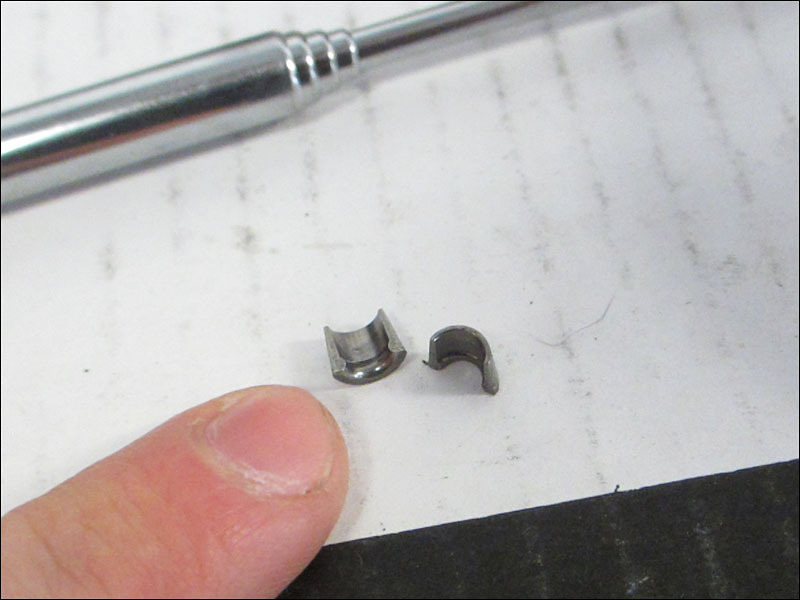 On the closer side of the cam journal you can see the smaller shim (small light colored wafer) in the larger valve spring retainer (dark grey circular) together. Last edited by Smithers; 03-07-2013 at 12:01 AM. Picture of one of the camshafts. 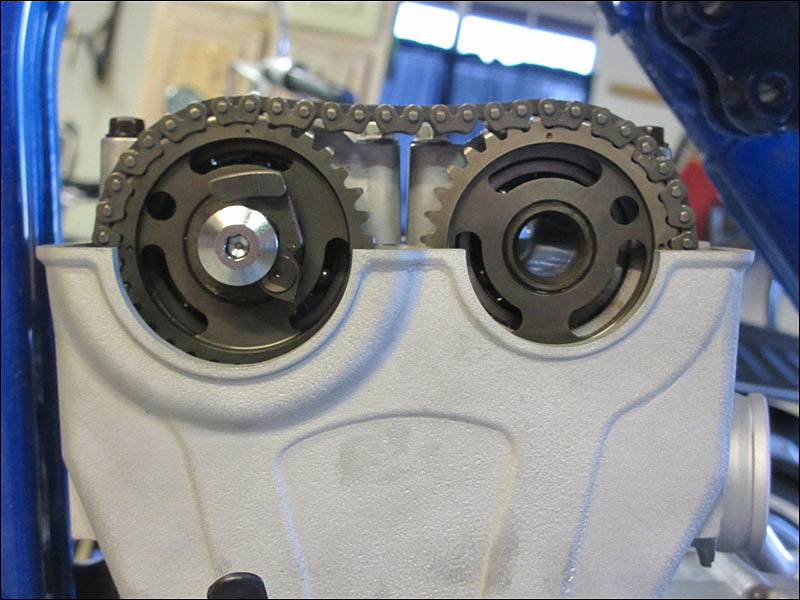 The camshaft spins on a bearing near the sprocket and a smaller journal that is between the cam lobes. There is a retainer piece that holds the cam bearing in place when the cam caps are put in place on top of them. Pics of a bucket and shim. And to put these in plain view here the cams can be seen in place and the buckets are actuated by the lobes that rotate and press down on them in time. Last edited by Smithers; 03-07-2013 at 12:06 AM. And I would like to post some specs explaining the torque specs when assembling the engine just for the record in case anyone else needs them. 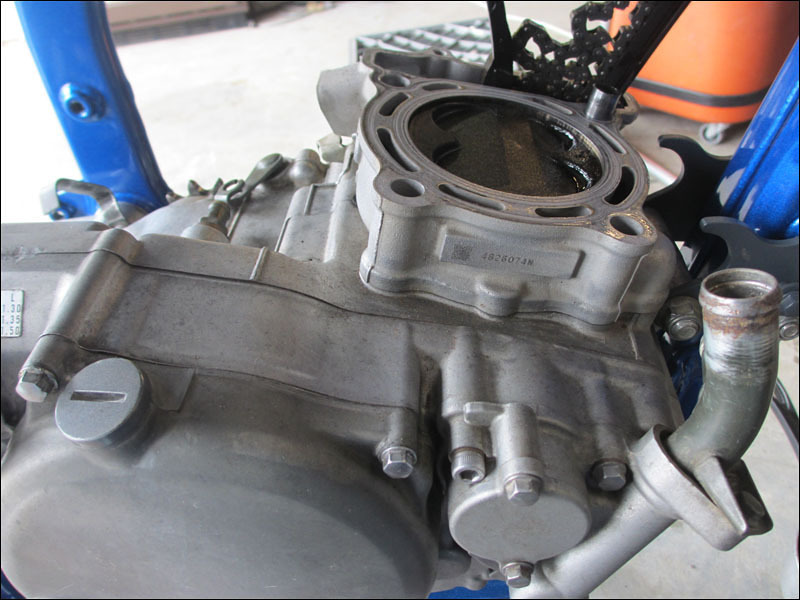 1st gen 2004-2005 RMZ250 and KX250F torque specifications for the whole bike. 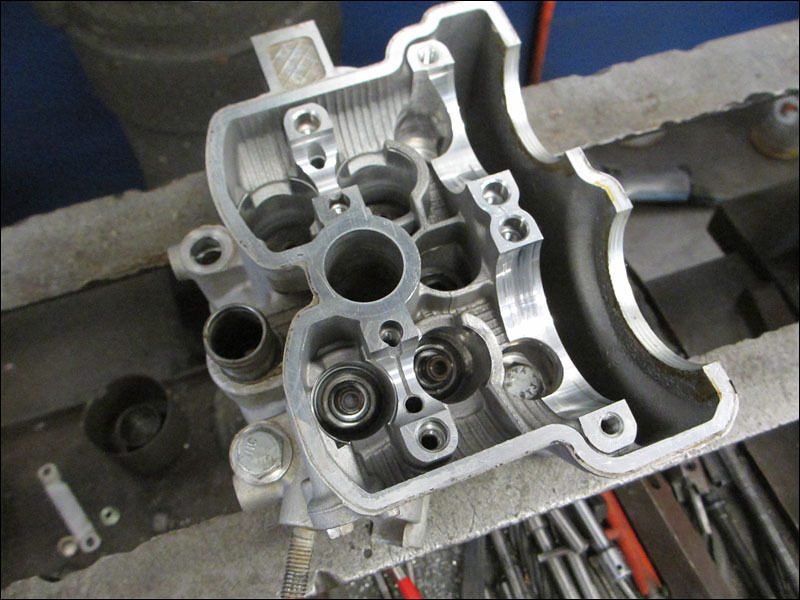 Checking valves in a modern 4 stroke motocross engine. Sounds like fun, Ryan. I'm getting ready to adjust the valves on my Triumph triple when the weather warms a bit. I bought a special Triumph tool to hold the lifters down while I swap shims. Hopefully most of the valves are still within spec. Ah that sounds like a time saver. Anything with multiple cylinders sure calls for some tools to speed things up that's for sure. It's no big deal to swap out shims. You just have to request shim donations from anyone on a forum that's willing. Lots of people have shim kits that hardly use any of them. It just a matter of time of course. 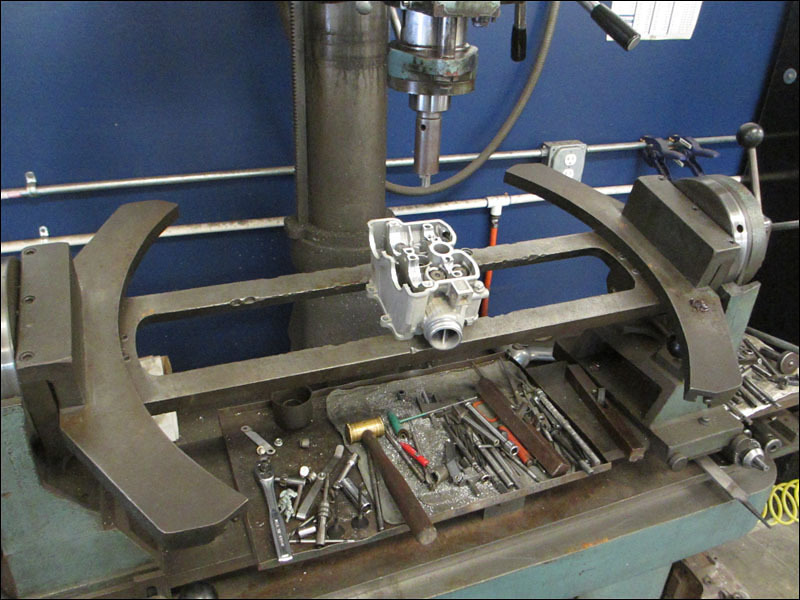 Here is a pic of a prep bench at my machinist's shop. 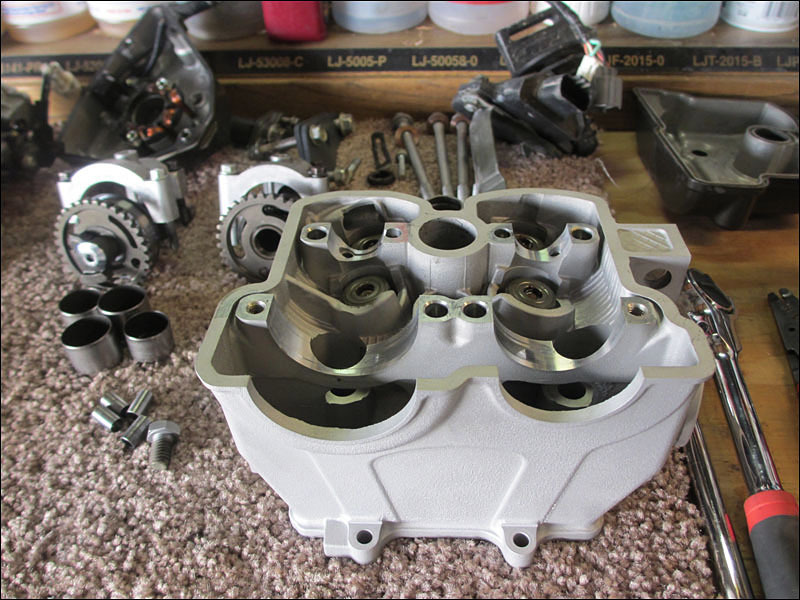 The RMZ head sitting next to the Honda Prelude cylinder head that I had machined at the same time. Meanwhile back at the garage... not much going on until the head comes back. Last edited by Smithers; 03-07-2013 at 12:13 AM. 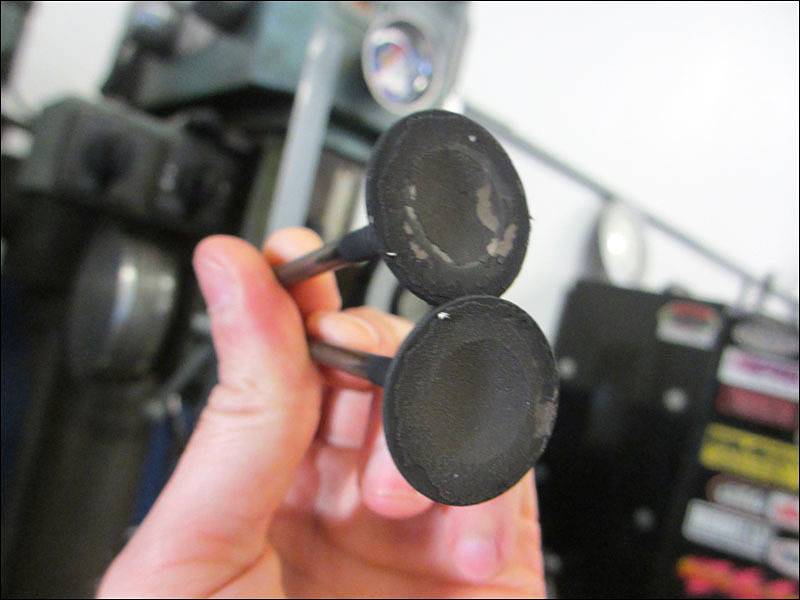 To show how much carbon buildup was on the inside of this engine in particular. I didn't bother to clean the carbon off myself. Any machinist should have a sand or bead blast cabinet to carefully clean any surfaces up quickly. 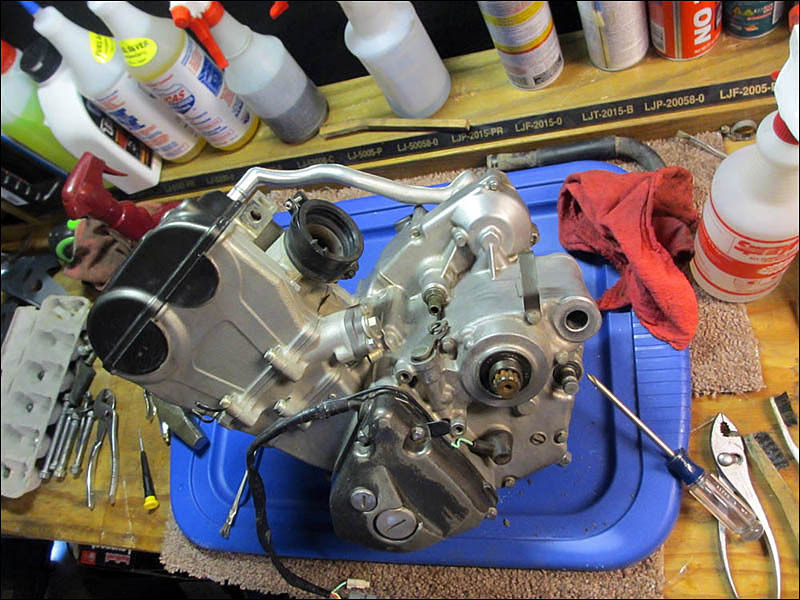 Make sure and remove the cylinder head bolt guides like the one you see sticking up in the top left hole. These should be removed until you are ready to put it back together. You don't want to lose any simple parts like that that will delay your rebuild. Last edited by Smithers; 03-07-2013 at 12:16 AM. Now for the behind the scenes stuff at the machine shop. 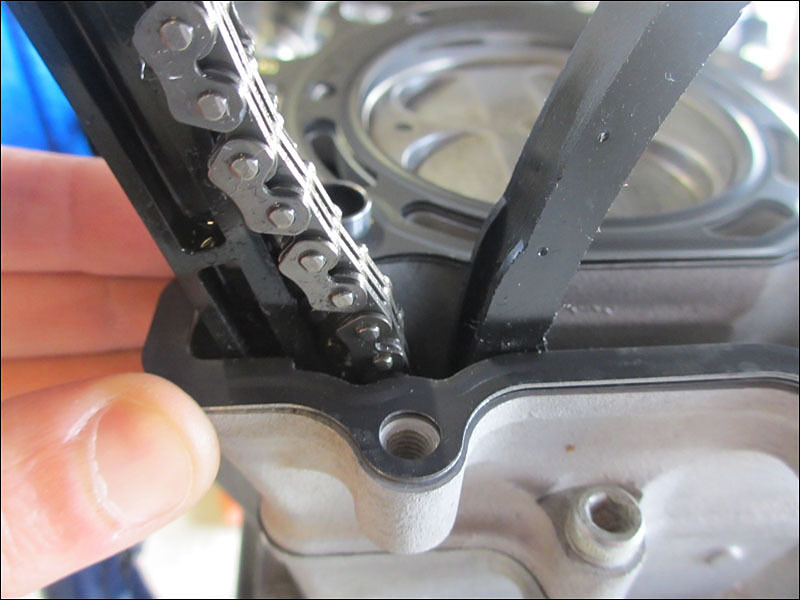 The keepers that hold down the valve spring retainers are SUPER small on these modern 4 stroke engines. 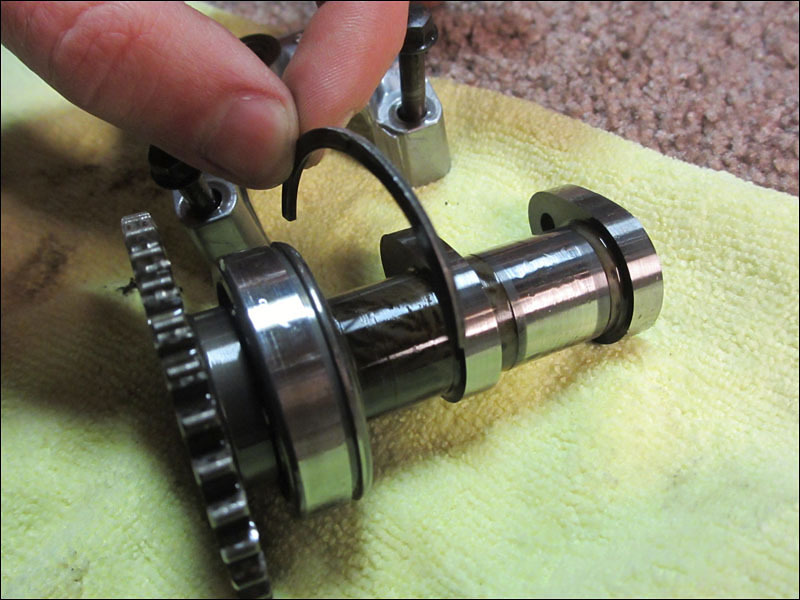 The spring retainers have to be pushed down far enough to remove the keepers from holding the end of the valve stem. If you lose any one of the tiny keepers then it's game over until you order new ones. Trust me, the can go flying under all of the pressure needed to push and hold down on the valve springs. A press is definitely the way to go in the process of holding down the valve springs in order to remove the tiny valve stem keepers. Once you have the spring retainers pressed down you still have to figure out how to remove the keepers. I use magnets to carefully remove them. My machinist uses a special tool he made to compress the assembly quickly. The smaller valve keepers I have ever seen. Last edited by Smithers; 03-07-2013 at 12:35 AM. 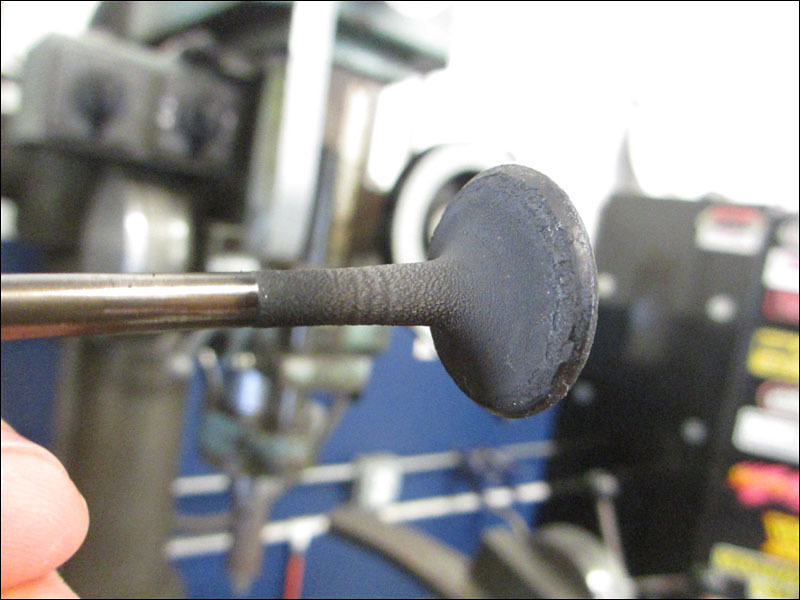 How well do you think this valve was seating with all of that carbon buildup? Last edited by Smithers; 03-07-2013 at 12:42 AM. 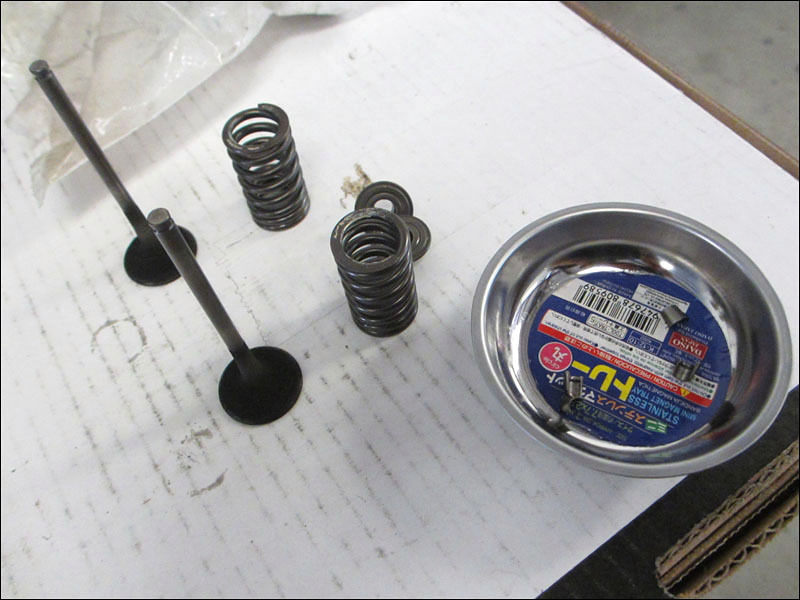 Another shot of the valves, springs and keepers. Magnetic tray to keep things held down in one place is vital. 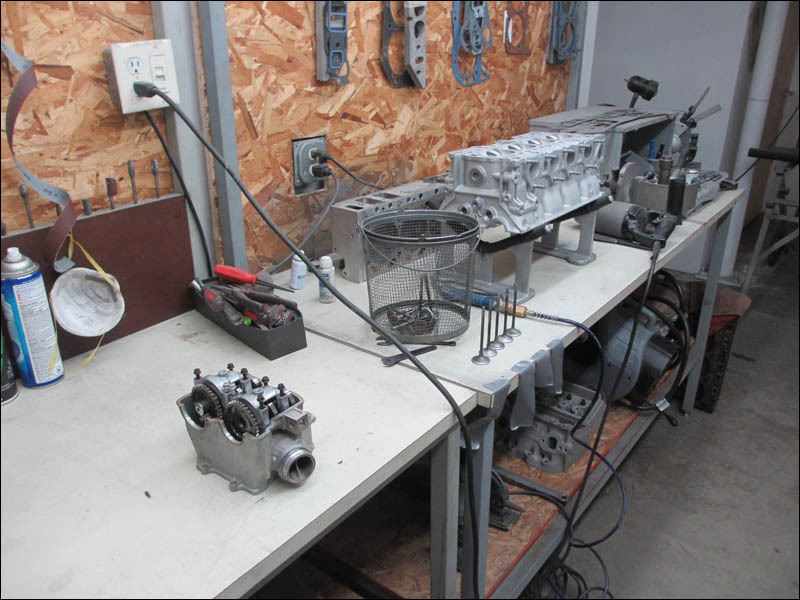 As soon as you and your favorite machinist or engine builder come up with a plan to rebuild your engine go and order the parts you need asap. Putting it off will only delay the whole ordeal. 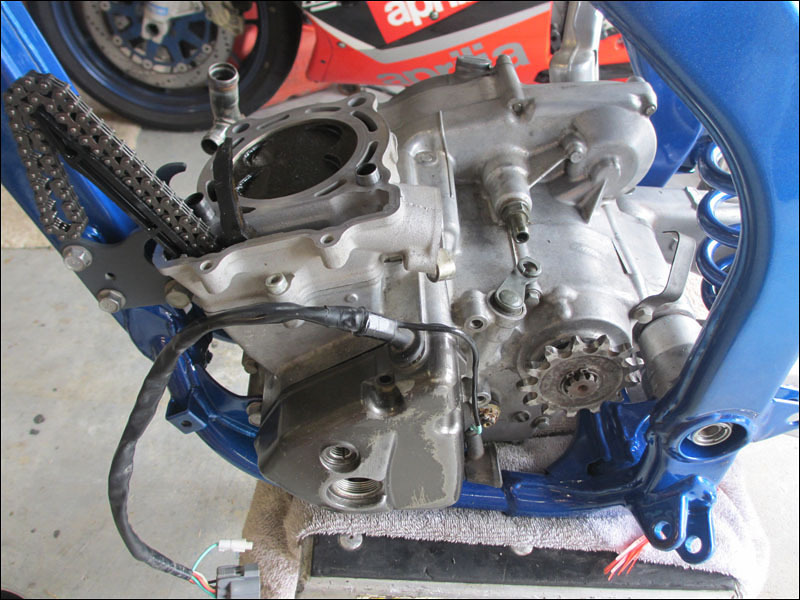 Having all your fresh parts in hand by the time the cylinder head work done is essential to getting back on the horse. If you haven't found a Suzuki or Kawasaki service manual to download I highly recommend you do. 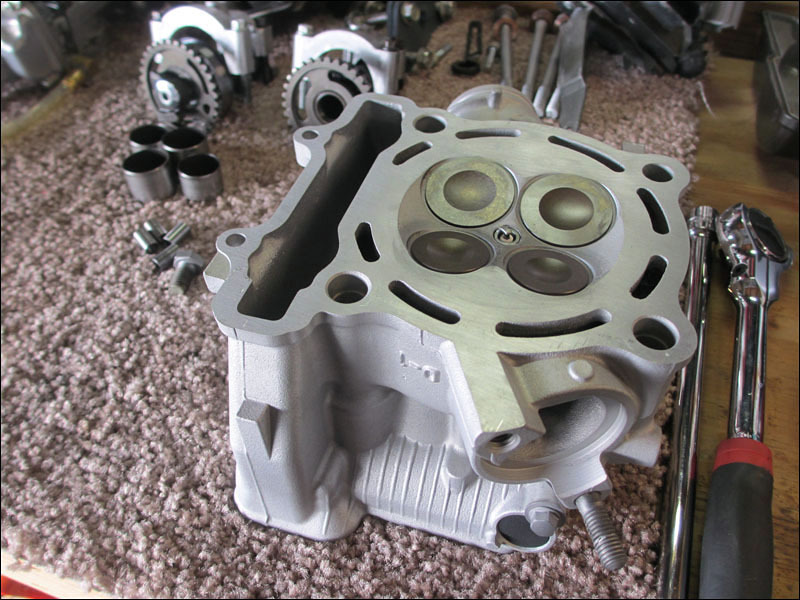 The service manual breaks down how to check the cylinder head for warpage and how to surface it down as well. 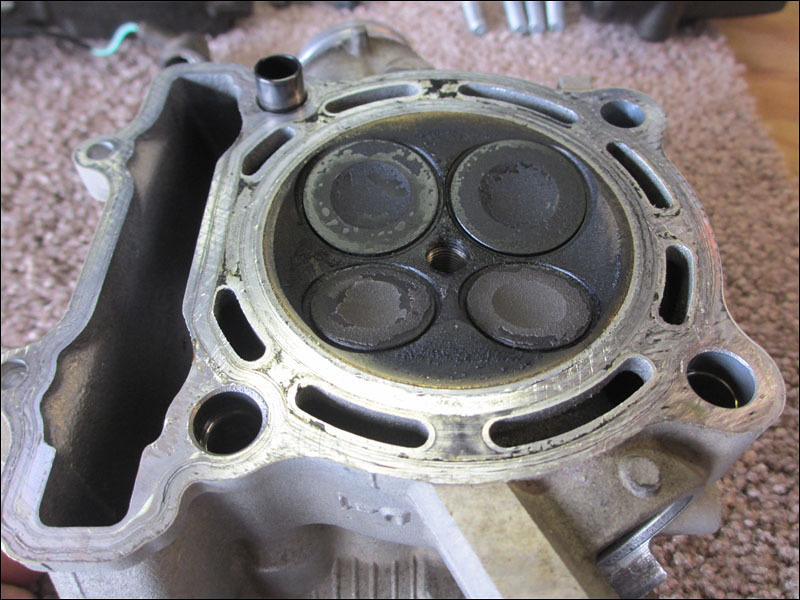 This is important to make sure you don't waste a head gasket trying to assemble a bad cylinder head. There are some good tips to learn from the manual and it will give you step by step instructions to do most everything. Now that my head is back time to organize everything and double check that we didn't lose anything. 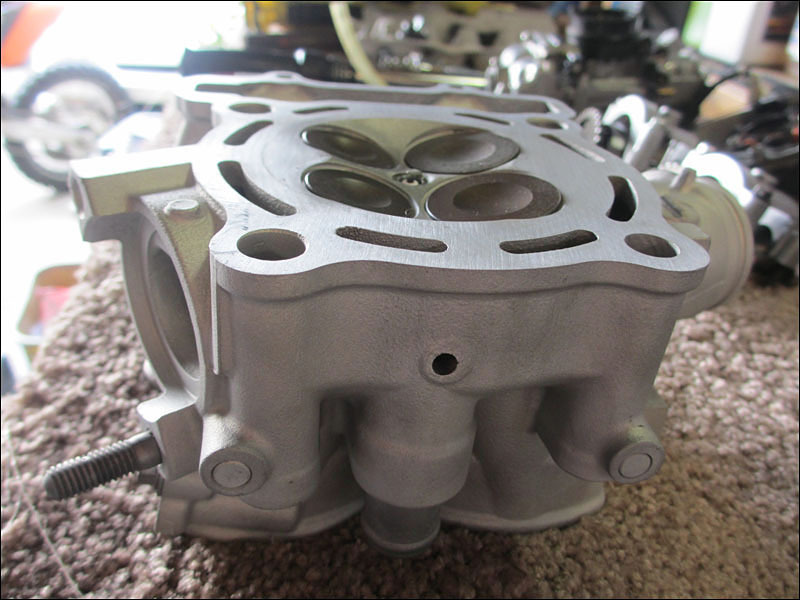 The surface of the cylinder head should be super flat and this cannot be done with the valves installed. 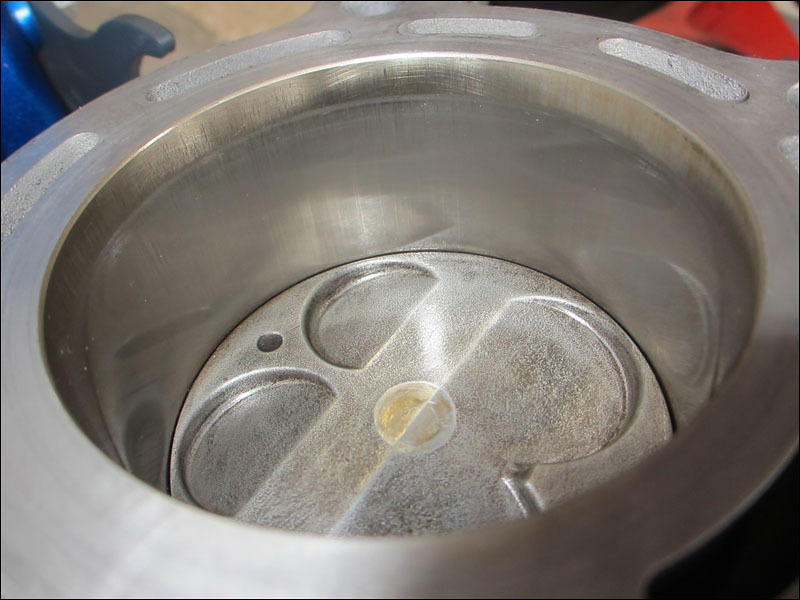 You can't get the surface flat with the valve heads sticking up from the head surface. Below is a picture of the head up close and notice the shadows displayed to the right of the valves showing that they protrude up from the head surface. 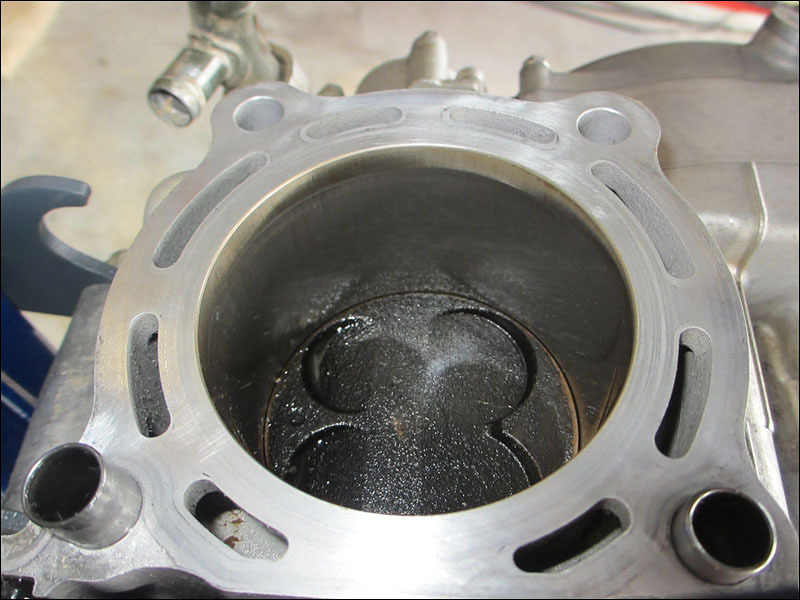 The valves need to be removed to surface the head. Time for the headgasket assembly finally! 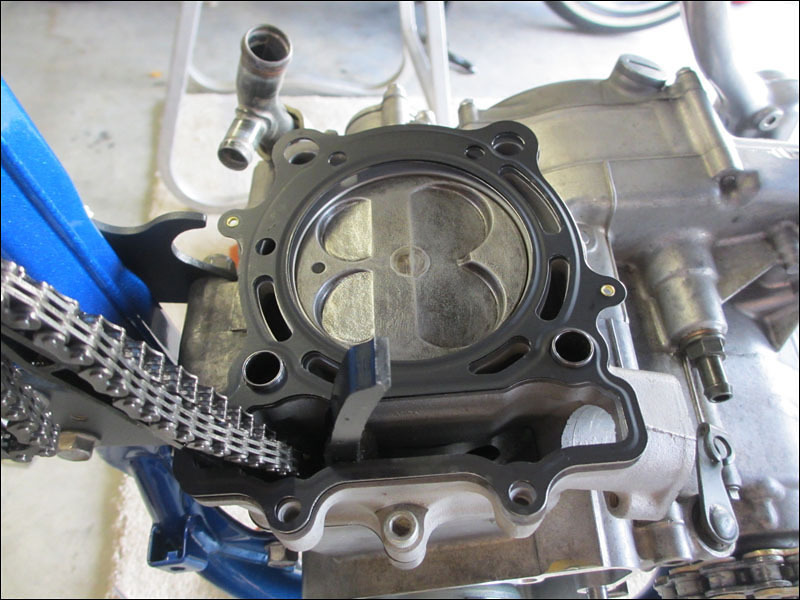 Grab your favorite multi-layer gasket and slap it down on the cylinder. It looks like it can go on with either side of the gasket up but looks a little closer! It goes on one way. Notice the notch near the front of the cam chain guide. It's more of a corner and not so much of a radius like can be seen near the rear (intake) cam chain guide. Reinstall just as you took it all apart. Cylinder head then TORQUE HEAD BOLTS. 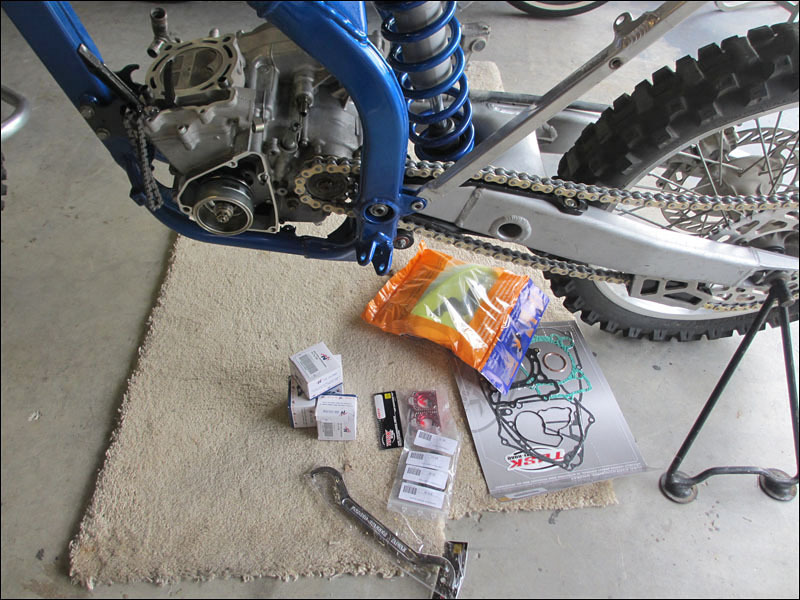 Now use a little oil, grease or assembly lube on parts as you assemble them. Follow the service manual and find top dead center (TDC) before you put the camshaft back in. 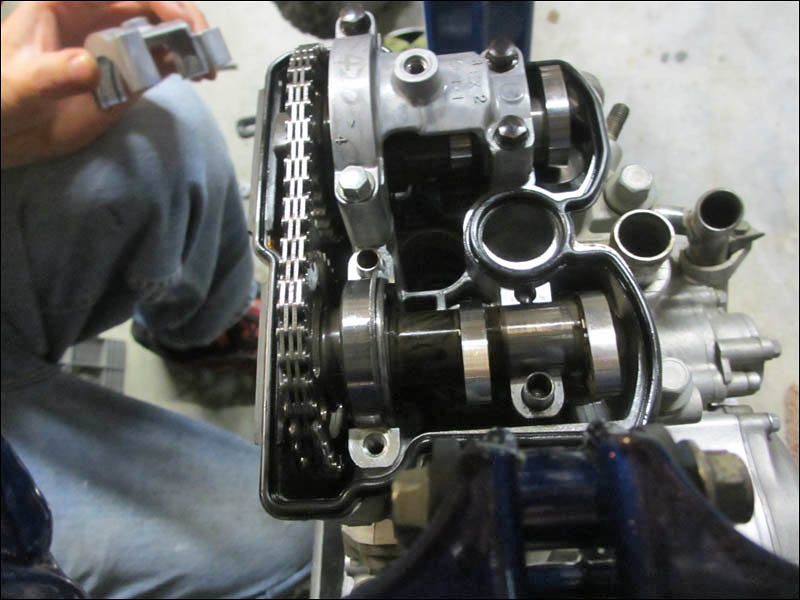 TDC then put the cams back on the head (cam marks in position) and the cam chain. 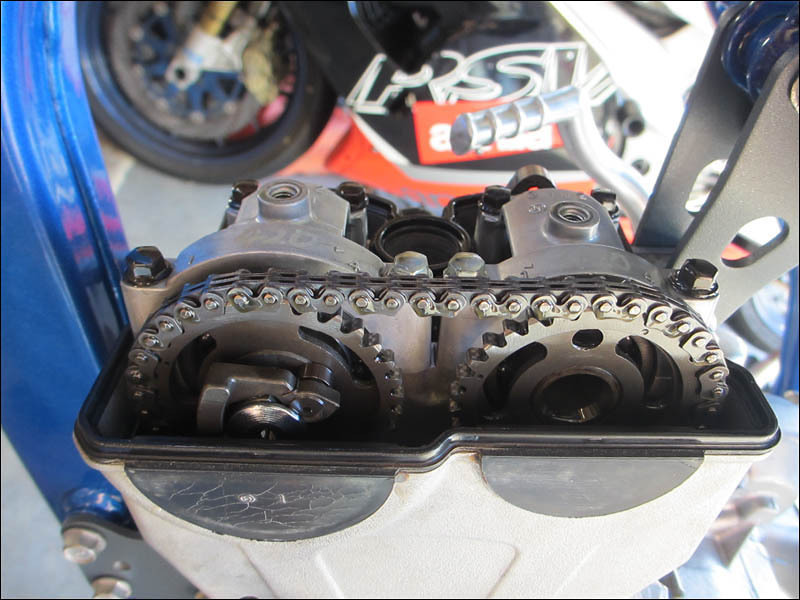 Just get it as close as possible then put the bearing retainer pieces in and install the cam caps snug to hold down the cams so you can check that the cam marks are lined up and you have the correct amount of chain pins in between the cam sprockets. Reading the service manual you will see there are 28 pins to count between the left and right cam timing marks. Next insert the cam chain tensioner just as the manual describes. Then spin the engine a couple times by hand and re-check your marks at TDC. THEN you can go ahead and torque down everything.